1 Preheat the oven to 170°C (150°C fan) | 325°F | gas 3. 2 Place a couple of saucers in the freezer; they will be needed for testing the jam's setting point. 3 Combine the cherries and water in a large saucepan and cook over a medium heat, stirring occasionally, until the fruit softens. Once soft, add the sugar and stir well, scraping down the sides of the saucepan. 4 Reduce the heat and simmer the fruit and sugar for 10-15 minutes until the sugar has dissolved, stirring the jam occasionally. Once the sugar has dissolved, increase the heat and boil the jam for 10 minutes. 5 Remove the saucepan from the heat and spoon a teaspoon of the hot jam onto the cold saucers from the freezer; when the jam has cooled, prod it to see if a skin has formed. If it has, the jam is ready. If not, continue boiling for a few more minutes before testing again. 6 Once the jam is ready to set, add the butter and stir well until dissolved into the jam; skim off any scum on top and discard. 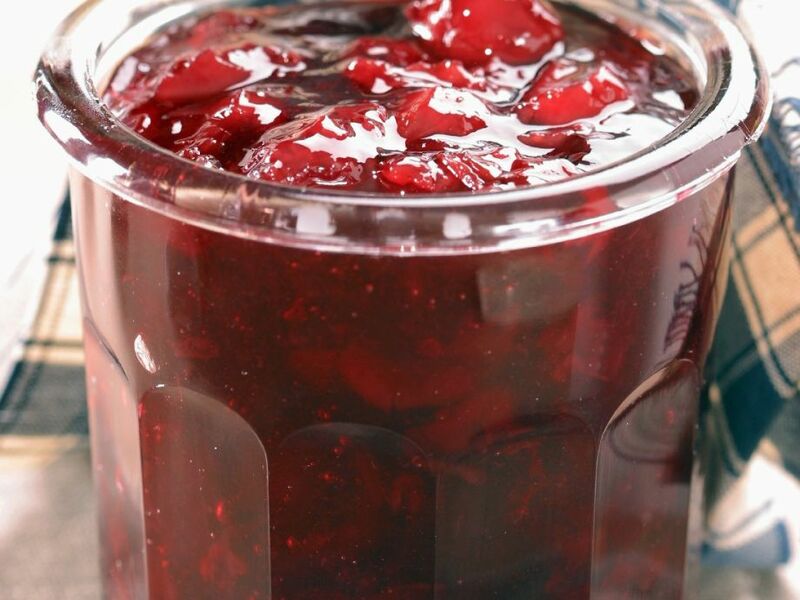 Place a 1 lb jam jar in the oven with its lids to sterilise. 7 Remove after 10 minutes and place on a flat, heatproof surface. Spoon the jam into the jar and cover the top with a waxed disc. 8 Seal well and let the jar cool to room temperature before serving.